MakerBot CupCake DIY 3D printer kit. Hewlett Packard, reigning inkjet giant, has partnered with Stratasys, a leading manufacturer of rapid prototyping machines, to bring 3D "printing" of solid objects to the desktop.The HP-Stratasys models have been described as small enough to sit on a desktop, quiet enough to use in an office, and priced under $15,000. Currently, Stratasys' most popular offerings under the Dimension brand, the "SST" series, are priced closer to $30,000, and are roughly the size of a small refrigerator. 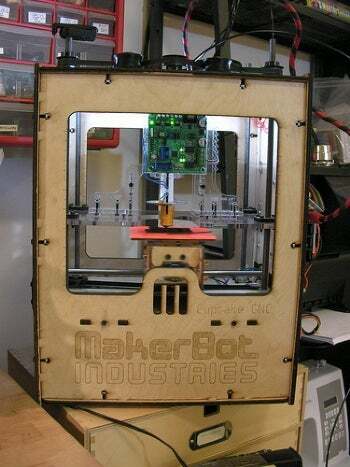 The push by HP-Stratasys to market an entry-level desktop rapid prototyping platform may have been spurred by a series of successful DIY projects; Most notable among them the "RepRap" and "MakerBot Cupcake", both of which sell as kits for under $1,000.